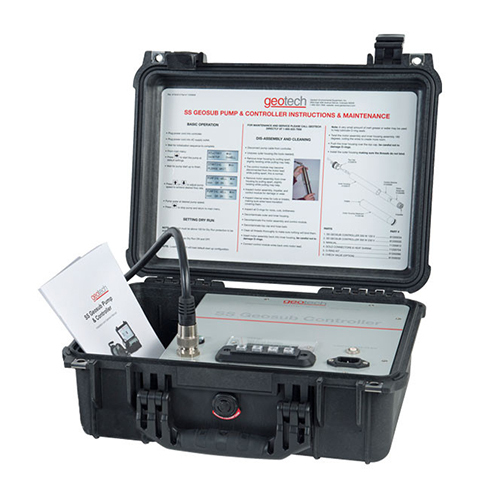 The SS Geosub Controller is designed specifically for use with Geotech’s SS Geosub Pump. It provides a safe conditioned variable DC output power from an AC power source. Built-in sensing gives the operator accurate and precise control over the pump during sampling events. 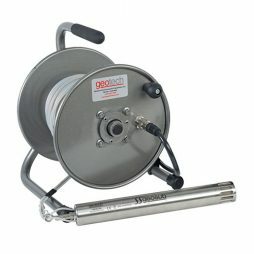 An average 1000 Watt gasoline powered generator with 1 gallon of gasoline can operate the SS Geosub Controller and Geotech’s sampling pump at full power for up to 18 hours continuously (generally much longer runtimes can be expected as the controller is used to reduce water flow for low flow sampling). An easy-to-use programmable user interface with bright display offers precise control of flow rates during groundwater sampling events. Site specific settings and conditions can easily be stored and recalled for more efficient repeatable sampling events. Rugged construction and easy to connect cables make setup and portability a breeze. In addition, the controller includes a user programmable dry run protection feature.